Brentford added to struggling Sunderland's relegation troubles by cruising to a 2-0 win on their first ever visit to the Stadium of Light. The Bees sealed victory in the first half as Kamohelo Mokotjo crashed in from the edge of the box and then Neal Maupay flicked in from close range. George Honeyman struck the bar for the Black Cats' best chance, but they were unable to make a breakthrough. Defeat leaves Sunderland three points adrift in the bottom three. 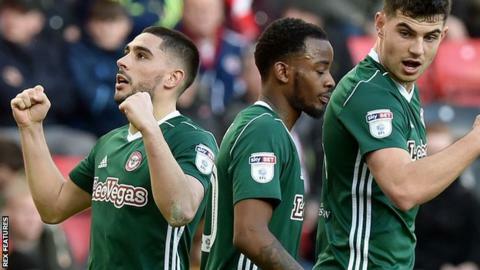 Sunderland's thrilling comeback to draw at Bristol City from 3-0 down seven days previously was a chink of light in their bid to avoid back-to-back relegations, but this game was a sobering reminder of the task that lies ahead if they are to achieve that feat. It took 15 minutes for Brentford to go in front as failure to clear the ball saw Mokotjo slam the ball low past Lee Camp for the first goal, and a delightful finish from Maupay doubled the lead before the half hour. With that cushion, the visitors were able to manage the game and despite the efforts of Joel Asoro and substitute Jonny Williams, Sunderland's miserable home run was stretched to just two wins in 26 home league games. "45 minutes in, 2-0 down, booed off; how many times can we come out and talk about the same things? "I'm trying to stay away from comparing the first half and second half. There were two goals, two preventable goals. "I think - why work hard Monday to Friday and work well, and then when we come on the big stage that happens? It was a loss not having Ovie Ejaria to put the foot on the ball in midfield and calm things down but the concern is the manner that the goals go in. I'm bitterly disappointed. "From the kick-off we started slashing at passes, if I could see that in training, I'd see a pattern, I'd know to expect that. It looks like we're panicking." "In the first half I thought we were excellent - as good as we've played for a while. We looked young, vibrant, energetic and showed a lot of quality. "We should probably have been more than two goals up and should have killed the game off before half-time. "In the second half we weren't anywhere near as good, we were a little bit sloppy on the ball, our decision making went to pot a little bit but to go away from home and score two goals and keep a clean sheet is always something that makes a head coach smile." Match ends, Sunderland 0, Brentford 2. Second Half ends, Sunderland 0, Brentford 2. Josh Clarke (Brentford) wins a free kick in the defensive half. Foul by Joel Asoro (Sunderland). Attempt blocked. Ollie Watkins (Brentford) right footed shot from the centre of the box is blocked. Assisted by Alan Judge. Corner, Sunderland. Conceded by Josh Clarke. Florian Jozefzoon (Brentford) wins a free kick in the defensive half. Attempt missed. Josh Maja (Sunderland) with an attempt from very close range is too high. Assisted by Aiden McGeady. Attempt missed. Aiden McGeady (Sunderland) left footed shot from the centre of the box misses to the right. Assisted by Lee Cattermole with a cross. Attempt missed. Alan Judge (Brentford) right footed shot from outside the box misses to the left. Assisted by Ollie Watkins following a fast break. Corner, Sunderland. Conceded by Alan Judge. Substitution, Brentford. Emiliano Marcondes replaces Neal Maupay. Attempt saved. George Honeyman (Sunderland) left footed shot from outside the box is saved in the bottom left corner. Attempt blocked. Aiden McGeady (Sunderland) right footed shot from outside the box is blocked. Assisted by Joel Asoro with a cross. Attempt missed. Josh Maja (Sunderland) header from very close range misses to the left. Assisted by Joel Asoro with a cross. Attempt missed. Jake Clarke-Salter (Sunderland) header from the centre of the box is just a bit too high. Assisted by Joel Asoro. Corner, Sunderland. Conceded by Andreas Bjelland. Attempt saved. Joel Asoro (Sunderland) left footed shot from outside the box is saved in the bottom right corner. Assisted by Jonathan Williams. Substitution, Brentford. Alan Judge replaces Kamohelo Mokotjo. Hand ball by Jonathan Williams (Sunderland). Corner, Brentford. Conceded by John O'Shea. Offside, Brentford. Florian Jozefzoon tries a through ball, but Romaine Sawyers is caught offside. Substitution, Sunderland. Josh Maja replaces Ashley Fletcher. Neal Maupay (Brentford) wins a free kick on the right wing. Henrik Dalsgaard (Brentford) wins a free kick in the attacking half. Jonathan Williams (Sunderland) wins a free kick in the defensive half. Florian Jozefzoon (Brentford) wins a free kick on the right wing. Foul by Adam Matthews (Sunderland). Attempt blocked. Romaine Sawyers (Brentford) right footed shot from outside the box is blocked. Assisted by Josh Clarke. Offside, Brentford. Daniel Bentley tries a through ball, but Romaine Sawyers is caught offside.